does the pump start as boiler fires or is the pump on delay till boiler temp rises? What is it connected to? Sounds like the load is taking the BTUs as fast or faster that the boiler is producing them? Closing down the valve slows the energy from the boiler to the load, the boiler temperature would rise as less GPM and BTUs delivered in the valved down condition. Had the same thing happen to me with a high mass radiant Pex tube in gyp/concrete directly pumped to the SlantFin sx-150 cast iron boiler. Fire the boiler up & it just absorbed all the btu's that boiler could put out to heat that giant mass of concrete. The whole time the boiler was condensing - not good for CI boilers. I Added the Danfoss ESBE Thermic to protect the boiler. The slab still accepts all the btu's, but the boiler is happier. It took well over 12hrs to bring the house up from 55*. I converted to Injection ODR & a buffer tank with remote internet control. It takes 2 days to heat up, but I set it before I leave Kansas & when I arrive in Colorado its warm. A good explanation of how heat transfer works and examples of how the emitters dictate the boiler operating temperatures. 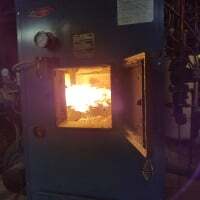 "If the load connected to the boiler can dissipate the full heat output from the boiler when supplied with only warm water, say 110°F, that’s as hot as the water temperature leaving the boiler will get. It doesn’t need to climb any higher, and won’t, even if the boiler’s high limit controller was set to 140°, 180°, or 220°. The conditions for thermal equilibrium are achieved at a supply water temperature of 110°, thus the first law of thermodynamics is satisfied". @hot rod Thanks The boiler is connected to a reheat loop in a 3 story office. I appreciate the link. @Docfletcher That is interesting. I will have to do more research. On two separate occasions I have installed a mod/con directly piped to a large single zone slab. Both were in warehouse type buildings. Both were fire tube and the flow requirements were perfect to direct pipe to the load. Upon commissioning, both ramped up high fire and stayed there for several hours never achieving set point until days later as dictated by outdoor reset. The heat able to be absorbed/dissipated by the slab even at 80F set point was more that the burner could produce. This was perfect as they operated in 97% efficiency and condensed like mad. I am of the opinion that the faster the flow the more BTUs being moved. It can be modeled with the hydronic formula, simulated with software, and measured in actual conditions. Comes a point where the exterminates flow doesn't gain a lot more transfer as shown pin this radiant loop example. The higher flow rates, tighter ∆ produce a higher AWT across the loop. A 10- 15 ∆ may be desirable in a residential radiant floor, and worth some extra pumping power to get there. The boiler may be happier with a wider delta, less cycling, so a hydro sep or primary secondary piping would allow different ∆s between the distribution and the boilers. Interesting where the lines cross at about 23 delta, 7500 btus, and .7 gpm. on the graph. Could that be the determined as the most efficient ratio? Certainly that ratio becomes convoluted because the example is a snapshot in time of an emitter. In real time the output is ever changing until thermoequilibrium is reached. The true constant is gpm unless variable speed pumping is used (delta t,delta p), then delta t could be the constant instead of gpm. i have seen it, cant explain it but it seemed i needed to lower the GPM to get higher supply temps thus higher return temps to allow the boiler to get over the hump where all its energy was going from just tempering the the return water to actually heating the water. the CI rads gave up the same HEAT, but the house finally responded to a greater TEMPERATURE delta. something about the three tenents of heat transfer. time, temp & turbulence. Back in my automotive days the old race drivers always said if you remove a thermostat completely the water will flow too fast through the radiator and an engine will overheat. They insist that you should gut a thermostat (leaving it as an orface) and the flow will be "just the right speed" and the engine won't overheat. Now, I've never experienced this and there are many variables in an engine driven centrifugal water pump such as engine load (btu output) and RPM (pump speed), and the two are not necessarily related. It never made any sense to my engineering mind. But, this would suggest it to be true. In the experiences where the flow was slowed to get a temp rise at the boiler, and out into the system. The question becomes if you would have not adjusted the flow would the system still have responded just over a longer period of time? People are use to seeing the boiler fire with temp rise results in a reasonable period of time. When this doesn’t happen then people think there is a problem, so they make adjustments to get the results they are use to seeing usually to the flow rate. So the question becomes if things were left alone, what would have been the out come? Sometimes patience is a virtue. Every time we talk about a systems parameters they are a snap shot in time. In real life it’s an ever changing scenario with only one possible constant through that scenario. I had same thing happen when I re- connected resistance elements in a 10kw 440VAC hanging electric air heater to run at residential 240V ~ 6kw,, but with same fan speed (fast). Air coming out was not warm, but my amp and volt meters said 6kw was definitely being dissipated into air flow. I'll slow the fan for hotter air. Don't want to wait for it to heat whole garage, it's spot heating ME in an unheated garage. You can over pump an boiler. I have cast iron radiators in an old monoflow system. Back about 10 years ago when I installed my Triangle Tube PE110 condensing gas boiler I have it piped P/S the Grundfos rep gave me an Grundfos Alpha circulator pump. When the boiler is firing and I have the Alpha pump on Auto the pump will pump about 8-9 GPM and I can see the supply water temp leaving the TT boiler dropping because I am over pumping the secondary zone. When I put the Alpha pump to its slowest speed 3 GPM the system works fine. seems exhaust temp monitoring would be useful as to setting boiler pump speed. are you/we changing the rest of the exhaust boiler settings? Maybe after they souped up the engine, the radiator was no longer able to dump the excess heat energy? The car radiator is a heat emitter, the engine a boiler. And like a heating system the radiator, or heat emitter drives the operating condition (temperature) of the engine. 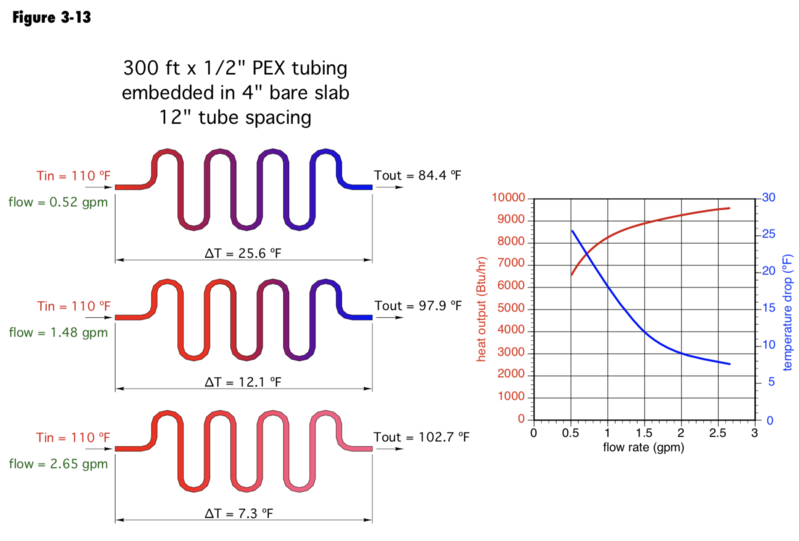 Higher flow, tighter ∆ should equate to a higher radiator temperature. A higher temperature radiator should exchange more heat to the ambient air, assuming the air is cooler. Of course the car would need to be moving, since a car radiator is a forced convection transfer. Or a large enough cooling fan to force the convection from the radiator to the surrounding air, when to is stopped or slow moving. Efficient as in pumping power required to move that many BTU? In the 3 examples AWT is 97, 103, 106°. The color of the loop sort of indicates how it might provide a more even floor temperature with less temperature drop from beginning to end. If the goal is an even, consistent floor temperature the tighter ∆ options might be right. Efficient as in the right amount of each delta, flow rate, and output. So long as the required load is met. Disregarding comfort of course in a radiant panel emitter. In this example we have variable boiler output, variable pumping, and variable emitter output no? All this depending on the engines rpm, and vehicles speed. I don't think so. if the heat loss of the structure just meets what the boiler can do at the conditions that cause this uber low return/supply temps it wont have the "horsepower" to get over the hump. the one time i saw this in action was after a new install during a cold Minnesota winter. the boiler would maintain heat loss, just not overcome it. Sorry, the boiler should just maintain heatloss not "get over the hump" In any condition. From design day to its lowest load. This is where modulation tries to mimic that matched load. I will add with a good control strategy on a mod/con you can get away with oversizing a bit, and locking out upper modulation until those below design conditions rear their ugly head. You are referring to a cold start condition where the emitter, and structure mass is well below a designed set point in a normal operating condition. So @ch4man what you are saying is if the throttling of flow did not take place to raise the supply temp the system would never reach set point? Just keep running for ever? No btus being made, or transferred to the emitter? I'll buy that. So can we say that laminar, and turbulent flows are dependent on fluid temperature as well? In other words at 180* turbulent flow exists at 10gpm, but at 55* fluid temp that same turbulent flow at 10gpm becomes laminar? to be fair, after we throttled down the flow and got the system heating we never found out how it turned out. the bldg owner ( rental housing) never called us back. so it either worked or it didnt and he called someone else. Melted TC jacket, and condensing equipment used plastic for vent material, yet we still want to use conventional equipment. Think about it. How much heat can you waste up the flue? The engine is running on ODR based on temperature, air speed, load, etc.